It took several weeks to get my stamp delivered. I have learned, that when dealing with manufacturers, anything can happen along the way! It is good to keep calling them to make sure they have received your emails, and/or they have understood what you want. My logo. Engraved on to hardened steel bar. Practising on stamping. I realised, that I wasn't able to hammer by hand, so I set the stamp on fly-press, to get the force needed to create even stamp. As the stamp is made to be used on straight surface, I am not able to use it on the side of my convex vessels. 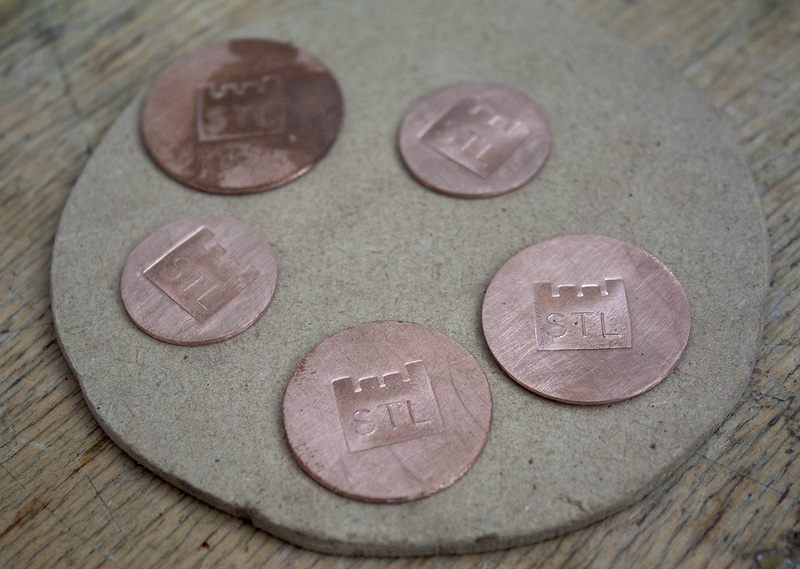 After pondering for while, I came up with an idea of stamping the logo on little copper coins, and then inserting the coin in to the vessel's base or lid. Trying to figure out the size of the coin.